BOYNTON BEACH, Fla. - Jan. 13, 2019 - PRLog -- Actors, writers, and filmmakers need excellent guidance to turn to for advice, encouragement, and support. There are new no-cost events each month beginning January 22 sponsored by Bob Carter's Actor's Workshop & Repertory Co. (Actor's Rep), 1000 N. Dixie Hwy, West Palm Beach. The group is called The Alliance at Actor's Rep. 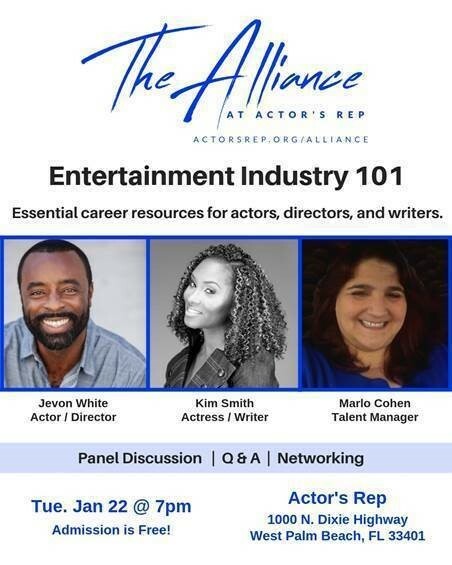 Guest speaker/panelists for the initial offering are actor director Jevon White, actress/writer Kimberly Smith, and talent manager Marlo Cohen. Ms. Smith says, "Don't go it alone. We intend to discuss all topics related to an actor's career, writing, and film-making in a relaxed, friendly environment." Everyone is welcome: stage and screen actors, directors, and writers from beginners to seasoned pros. The first event, Tuesday, January 22 at 7 p.m., called Entertainment Industry 101, will start with the panel discussion followed by questions and discussion.